On the second week of our visit to Hao the president of French Polynesia came to visit the atoll. As a welcome, the locals put on a traditional dance and drumming performance. After the event a lovely lady in her early 30s approached us to offer leis made from coconut fronds. “Welcome to Hao!” She exclaimed with a big smile. Her name is Tevahine, which in Tahitian means “the woman”. Simple and effective! She was quite gracious and invited us to visit her house for lunch. This meant that she had to borrow bicycles from relatives in the village, since her house was a 30 minute bike ride away. When all was arranged, we rode together along the streets of Hao with our new friend. 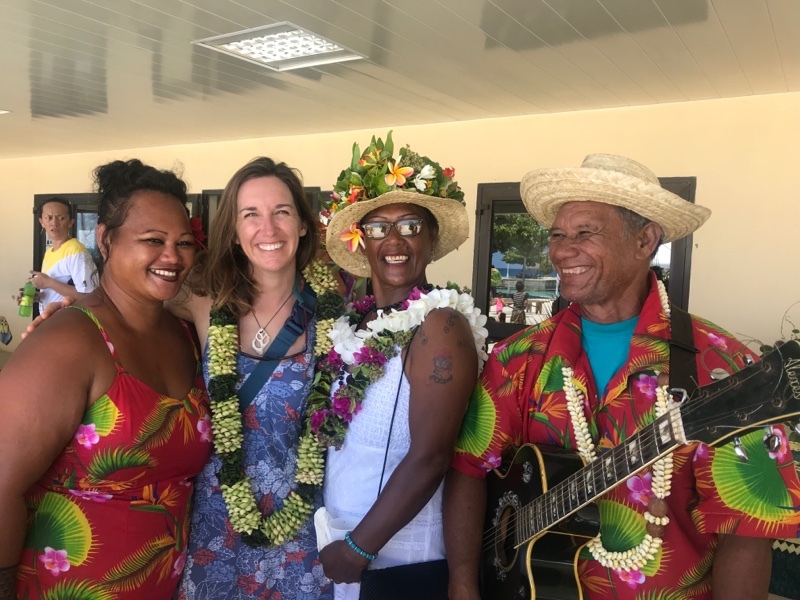 Photo below, from left to right: Tevahine; Sabrina wearing the coconut lei; Tevahine’s aunt; and Ipu (who is our laundry angel and first host in Hao), holding his guitar which he played during the performance. Ipu is also Tevahine’s uncle. Of course, everyone is related! What a great experience. That’s the life, laid-back and and enjoying life, isolated from turmoil. A wonderful photo of warmth and welcome. Bet you’re tempted to stay……..why not? September is a long time away.